Amish Quilt Auction - Clare County - Where the North Begins! with roots going back to the original founders from Switzerland. 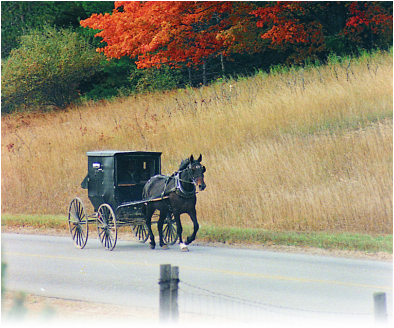 The Amish way of life is one of simple enjoyment of the land and community. Skills are passed down through the generations. The Amish craftsmen are renowned for their finely crafted products including furniture, quilts and baskets. Offered for purchase along the roadsides when weather permits, are baked goods and produce from their farms. The Yoders and their friends hold a large quilt auction and craft show each spring and late summer (Fri. and Sat.of Labor Day weekend). Imagine farm fields transformed with rows of crafters, antiques and flea marketers hundreds of vendors in all! This event is one of the largest, well attended, craft shows, flea markets and quilt auctions in Michigan. In addition to the Amish crafted furniture, quilts and goods, one may purchase an array of arts and crafts items, discounted tools, jewelry,cutlery, jams and plants to name a few. A number of concession stands and several food specialty tents, featuring baked goods and cheese, are hosted by the Amish women. Parking is best downtown Clare with shuttle services running to and from the auction site on a regular basis. The Yoders also host a horse and equipment auction two weeks before the quilt auction each spring and two weeks after each fall. A Horse and Equipment Consignment Auction is held before the Quilt and Craft Show in the spring- and after the Quilt and Craft Show in the fall. Prices obtained for these items are fair due to the large number of buyers present. Sales commissions are similar to those charged by private auctioneer services. While we happily promote this wonderful event, please remember to respect our Amish neighbors. Sales for the auction are Friday and Saturday only with no Sunday sales. Please help our neighbors enjoy the quiet lifestyle that they prefer most days of the year. GO 2 MILES TO LEATON RD; TURN LEFT ON LEATON FOR 1/2 MILE. MERGE ONTO US 127 SOUTH; TAKE FIRST EXIT INTO CLARE GO TO SECOND LIGHT (5TH STREET/BUSINESS 10) TURN LEFT AT DOHERTY HOTEL ONTO BUSINESS 10; GO EAST 3 MILES TO LEATON RD. TURN RIGHT ON LEATON. GO 1/2 MILE; FARM IS ON WEST SIDE. TURN RIGHT; GO TO SECOND LIGHT (5TH STREET/BUSINESS 10 EAST) TURN LEFT AT THE DOHERTY HOTEL; GO 3 MILES TO LEATON RD; TURN RIGHT ON LEATON; FARM IS ON WEST SIDE.